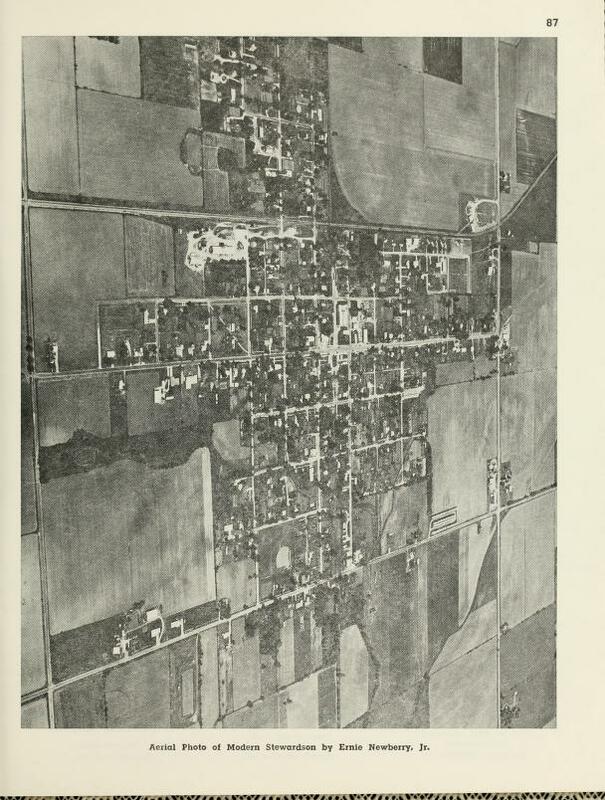 Stewardson, the First 100 Years: History of the Village of Stewardson, Prairie Township and Vicinity contains many photos within its 100 pages. YOUR HELP IS NEEDED to provide additional excerpts and images. 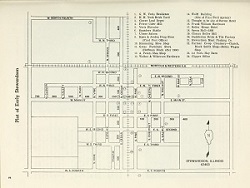 A copy of the original plat of the Stewardson Cemetery was given to the Village Board by Harold H. Ulmer. The plat is dated November 22, 1878, and was filed at the Courthouse, March 12, 1879. It was signed by Henry Duensing, President of the Board, and Fredrick Hoese, Village Clerk. Mr. Duensing was Harold Ulmer's grandfather. The first addition to the cemetery was added in 1911. The minutes of the Village Board show that this land was bought from Dr. T. L. Ingram for $500.50, and the right to a choice lot. They then sold one acre of this land to Joe Powell for $200. The second addition was recorded in 1943 and the third addition, in 1949. At the present time, about one-half of this addition has been laid out for sale. A memorial monument for Daniel Leffler shows the date of his death, March 5, 1863, so apparently some people were buried here before the original plat was recorded. The Wolf Creek Cemetery is located in the church yard of the former Wolf Creek Church, about three miles southwest of Stewardson. On June 6, 1877 Adam Kessler deeded to Henry Barns, Charles Heideman and Adam Kessler Trustees of the Emmanuel Church of the Evangical Association, better known as the Wolf Creek Church, two acres of ground. The east half was to be used as a place of divine worship, and the west half to be used as a burial ground for the church membership. For many years interested families maintained the cemetery. It is used very infrequently for burials now. The Rockford Cemetery is located northwest of Stewardson, about one mile west of the old Rockford School building, then about one-half mile south down a lane, in a very secluded spot, on land owned by Tom Fox. It was originally called the Welton Cemetery and contains the graves of many members of the Welton Family. At one time there was a Utile church adjoining the west edge of the cemetery, called the Rockford Church, and the cemetery gradually took the name of Rockford. The church was used mainly for funeral services. Records show burials as early as 1842. The Mound Cemetery Is located two miles south and one-half mile east of Stewardson, and encompasses a plot 437 ft., with many familiar names on the stones. An additional 48 ft. was later added to the south end. The ground was given by John Beals, a great-great-grandfather of relatives in and around Stewardson. Some stones are dated as far back as 1820. Names on others can no longer be read, while many stones have fallen over and are covered with grass, all giving the appearance of a very old cemetery. In early days Sunday School, as well as some burial services, were held in the Mound School adjoining the cemetery. For many years interested people tried to take care of the cemetery, mowing and cleaning it at least once a year, and maintaining a good fence around it. The Rincker Cemetery is located about two miles north on Route 32 and one fourth mile east. It was acquired by the Trinity Lutheran Church of Stewardson in 1871. Mrs. Theophilus Rincker, the grandmother of many relatives in and around Stewardson, deeded one acre of ground to the church for use as a cemetery, with the stipulation that a fence be maintained around it. Approximately one-fourth of the plot was to be reserved for use by the Rincker family. For many years it was cared for by the congregation of the church, later it was decided by the trustees of the church to no longer retain it. One of the oldest Fire Insurance Companies formed by area residents for the mutual protection of its members and still active at this time is The Banner Township Mutual Fire Insurance Company. It was originally founded in the year of 1878 as The German Banner Township Mutual Fire Insurance Company. Minutes of The Company meetings were sketchy and indistinct until 1911 and were handwritten in German until 1914, thus making an accurate translation into English of its proceedings prior to 1911 rather difficult. It was indicated however, that August Bugenhagen and Michael Weber took an active part in the early history of the company. C. F. Friese, Agent & Director from 1911 to 1928. L. C. Friese, Director from 1912 to 1930, Agent in 1928. Wm. Krumreich, Director in 1928, Agent and Director from 1929 to 1938. Herman Appelt, Director in 1930. Chris Kruger, Director from 1931 to 1936, Vice President and Director from 1936 to 1954. Heman Noffke, Agent and Director from 1938 till his death in 1971. Local persons now serving the Company at this time are as follows: Edwin Manhart, Vice President and Director from 1954 to 1959, President and Director from 1959 to present time. Rufus G. Kull, Agent and Director from 1969 to 1971, Director from 1971 to present time. Kenneth E. Noffke, Agent and Director from 1971 to present time. This firm was started in 1929 by Ben and Ira Gawthrop with their office in the back of the Opera Hall building. Mrs Ira (Wanda Mautz) Gawthrop operated the office and she says that some weeks she would mail as many as one thousand cards, quoting the current pay prices to prospective sellers. They did a big business, Wanda recalls filling out shipping invoices for 21 cars of hay in one day. Some of these were shipped from other nearby towns, she thinks that this was in 1933, a very dry year. They owned the haybarn that stood at the intersection of North First and North Chestnut. They would fill the bam with hay at harvest Ume and then ship it out during the winter. They shipped their hay to customers in the southern states. Ira had worked for Voris' before he went into business with his father, Ben. They bad a hay office in Mattoon,Ill. before they started here. The State Protective Mutual Benefit Association had its headquarters in Stewardson in the 1920's. It was owned and operated by Ben Gawthrop and Mr. and Mrs. Ira Gawthrop from their office in the Opera Hall building. They had agents in surrounding towns and got most of their policyholders from these out of town agents. When a policyholder died each of the living policyholders paid $1.00 and the deceased's claim was paid from these payments. The Gawthrop's operated this company for five or six years and then sold the agency to another company that reinsured all of their policyholders. There were several of these Burial Societies in towns nearby. One in Neoga was one of the last ones to go out of business. To keep a company like this financially sound it was necessary to have an equal number of young policyholders and older ones. It was easier to sell to the older people and this made the payments come too close together and the healthy policyholders started dropping out. Odirone Reynolds, Ed's son operated the restaurant in the Block Building. In 1940 he purchased the Drug Store from Burgess, operator of a Drug Store in Shelbyville, II. Along with operating this Drug Store he operated a Wholesale Candy and Novelty business. About 1945 he sold the Drug Store to Russell Turner and moved to Effingham. Wilford Timperley ran a Restaurant in a building south of Mautz's 5 & 10 cent store. A broom factory was in this building for a short time. A Mr. Daper operated a restaurant in the building by Wilson's Garage. Jacob Yakey had the Surge dealership for many years. H. D. Yakey worked for Jacob Yakey for several years and in 1953 bought the dealership from the elder Mr. Yakey. In 1938 Wayne Moomaw built an ice house where he stocked ice for ice boxes etc. One fourth of July Wayne sold 15 tons of ice. He also kept watermelons during season. In 1951 Lucille Huffmaster and John and Melba Middlesworth leased the Friese Cafe and operated it during the summer months. Guy Schuyler was a barber in Stewardson at different times in the early 190O's. At one time he was in a shop with Orpheus Robey and another time with Leroy Correll. He barbered and farmed and after quitting a shop in Stewardson about 1918 he moved to a farm near Beecher City. He operated a barber shop in his home for several years. Clete Nosbisch operated a junk yard on North Pine St. for several years, before his death in 1973. About 21 years ago Grace Falk Cecil and her son, John bought the building at 134 S. Pine St. from Fred Milchman, who had built it. They sold dry goods, dresses and shoes and operated a grocery and meat market in the Fred Milchman building at 124. S. Pine. After they sold the grocery and meat market Grace operated the Dry Goods Store by herself for several years and then sold the business to Earl and Noberta Renshaw. They sold their stock to Bob King, who moved it to the original Milchman Meat Market building. Grace still owns the building and rents it to Rail and Truck Salvage. Burl Hobson, who has just purchased the Engel Building, operated an auto repair shop in the garage building on South Cedar and a blacksmith shop in the private garage at 322 West Main Street. His brother, James F. Finks was in charge of the construction and the very early operation of the bulk plant. Gasoline pumps were installed about the same time on the curb on the north side of Main Street. Mr. Finks sold his business to Stanley Steagall, who operated it and after his death Mrs. Steagall continued the business for several years. Max Hoyer managed the business for her at one time. In 1926, Victor Keller was the agent for Texaco gasoline and motor oil. K. L. Moran Appliance Co. This trade name was adopted in 1942 to service Skelgas accounts. Kenneth, from his youth had been interested in radios, telephones, and electricity, and has been active in operating and repairing these and doing electrical work. He had done a lot of electrical wiring in this area including work for R.E.A. projects. He operated an appliance store in Beecher City for a short time. After the war he went to an independent distributorship with the name Moran's Bottle Gas. At one time he operated the Liberty Theatre in Stewardson for Mr. and Mrs. Omer Macy. He has done Evangelistic work for many years, pastored two churches, held revivals, and has been broadcasting the Gospel over the radio for ten years. Mrs. Elmer Baumgarten operated the restaurant in what is now the storage room at the west part of the Strohl Grocery Building. She purchased the business from Eugene Rothrock. He had obtained it from Harold Gillespey. After operating it from 1950 to 1952, she sold out to Viola Smith. Junior Keller operated it after Mrs. Smith; and when Walter Strohl needed the room for his grocery business, Keller bought out Anna Friese in the Yakey building and moved there. Harrison Fouste was a prominent businessman in Stewardson for several years starting back in the 1920's. He worked for Voris Bros, in their hay and grain business. He went into the hay business, a partner part of the time with Earl Wilson. He bought hay from local farmers and shipped to markets in the cities and the southern part of the U.S. He operated an insurance agency for many years, along with being the township supervisor, secretary of the Building and Loan, village clerk and Justice of the Peace. His daughter, Marie Tate says that she remembered him performing a marriage ceremony. He was Justice of the Peace when this office was used to settle small lawsuits. I, Glen Giesler, was subpoened by Casey Bamett, a constable, one time to serve on a jury in a trial in Mr. Fouste's court. At that time he had his office upstairs in the Bank Building. Later he moved his office to the former Wabash Depot building. Mr. Fouste was also a cashier in the bank for a while. Mr. and Mrs. Jack Ashenbremer operated a grocery store in the building on the southeast corner of the intersection of Cedar and Main St. during 1937 and 38. They bought the business from Walter Donaldson. For many years, John Manhart operated a plumbing and tin shop in a frame building just south of the bank building. Elmer Falk had a general merchandise store in Herborn. He bought cream, eggs, poultry, and sold groceries of all kinds, clothes, and dry goods. His store in Herborn burned in October 1931. He rebuilt the store; and when he quit the business there, the building was moved to Stewardson and was converted into a residence at 113 South Cedar, where his daughter, Mrs. Gilbert Brummerstedt, and her husband live now. In Stewardson he operated a grocery store at 106 East Main Street, and Falk's Produce at 113 North Pine Street. He sold the grocery store to Orville Cohea, and Mr. Falk's son-in-law is still operating Falk Produce. Mr. Falk operated huckster wagons from his Herborn and Stewardson stores. These were trucks loaded with the items most needed by rural people, and the driver went from house to house on regular routes. They bought chickens, as many people would sell enough chickens to pay for the items that they bought. John Tanner operated the Tanner Grain and Feed Company and erected the building, bins and elevator north of the Wente Locker Service. Starting in 1929 Jerry Lugar, Cobert's father, bottled fresh milk at his farm at the east end of Main Street, the Rose Fouste farm now, and delivered it in Stewardson. Cobert and Leona bought the Holmes Building, 117 W. Main St., and operated a dairy there. They bought raw milk from some local farmers, bottled it and delivered it to the residences and businesses in town. They collected the milk two times a day and delivered two times a day because many people didn't have a way of keeping the milk cool to keep it from spoiling. This was in the good old days before everyone had electric refrigerators. In 1943 the Lugars sold their business to Rubins at Shelbyville and worked for them. George Steagall bought the Poultry House that stood at the comer of South Second and Pine Street. Later his son, Stanley bought the business and then later moved it to Main Street in the building that is now occupied by Springer's Chevrolet. Stanley bought the M. O. Finks Bulk Oil Business and operated a service station in the garage building in the 100 block on South Cedar Street. Later he bought the Frank Williams Hardware Building and remodeled it for a service station. After his death, Mrs. Steagall operated the business. Ed Reynolds was a business man back in the early 190O's. He worked for Art Roley in the implement business in 1902, helping set up windmills. He was a partner with Charles Ragle in a harness shop for some time. In 1918 he built the flour mill on North Pine Street and operated it for a short time. 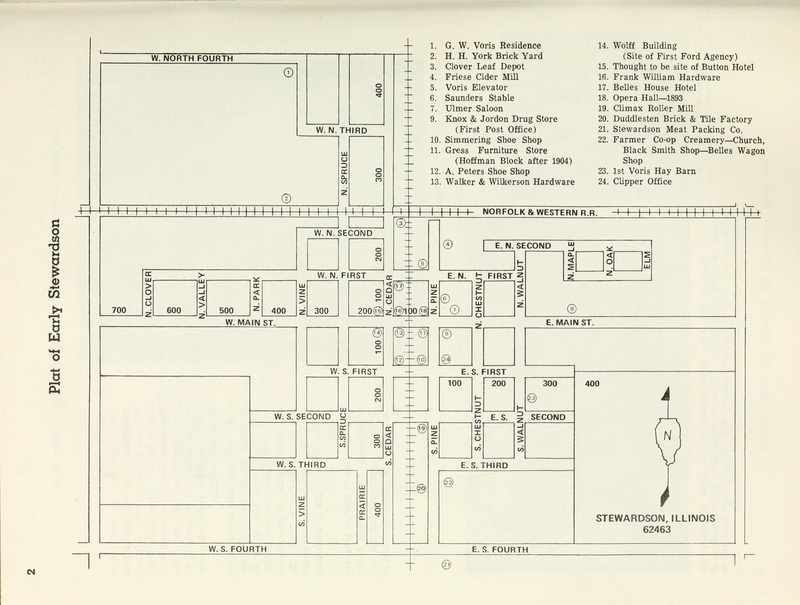 He then operated a restaurant in the Block Building about 1920, then moved to the new Milchman Building (Strohl's Grocery now) for a short time and then moved back to the Block Building.